During our continuous journey in South America that started in 2007, we visited Bolivia six times. In total we spent about a year in this diverse country. We were particularly captivated by the extremes in landscapes and the Bolivians’ strong need for celebrations. Although we never planned to be in a certain place for a particular festival, procession, or fiesta, we stumbled on them regularly. Some were small celebrations in a village, others were festivals held throughout the country. Somebody told me that in many places they have some sort of celebration at least once, if not twice a month. I wouldn’t be surprised if indeed that was the case. These celebrations, most of them held for religious reasons, are colorful events. They probably include pagan as well as Christian elements, processions with traditional dances and music, fireworks and lots of alcohol. The otherwise somewhat introvert Bolivians – at least in the highlands – open up as soon as they participate in a parade to honor the Virgin, or have drunk some chichas, an alcoholic, homemade drink made of corn. One of the weirdest we came across was what we labeled the ‘sheep-hurling fiesta’ in Presto, a village near Sucre. As the chicha started to flow during this multiple-day event, men started hurling sheep – dead ones, that is. Here’s the story. While celebrations happen all over the country and throughout the year, here are five renowned religious festivals that will give you an impression of what you may come across. Alasitas is Bolivia’s festival of small-wishes and is annually held in different towns at different times (La Paz = January 24). 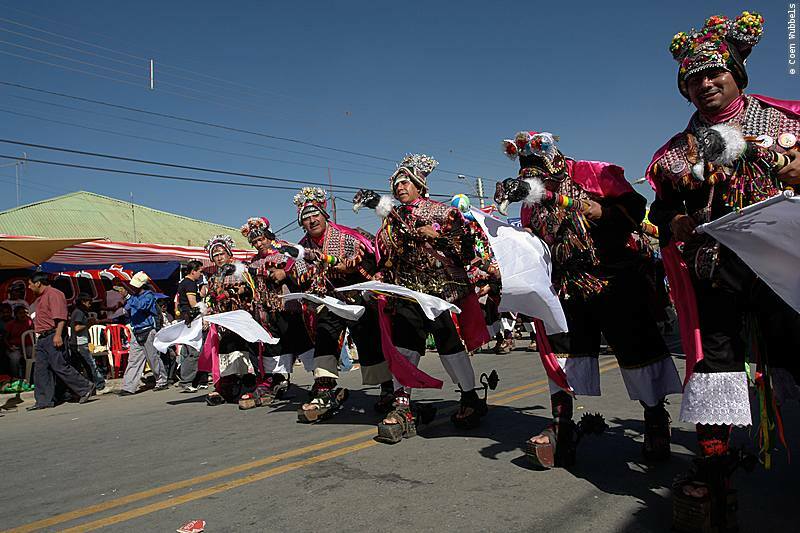 The festival has grown into a mixture of Catholicism with age-old Andes traditions. Whereas the Franciscans focus on the Virgin and the yatiris – (local shamans) focus on the Andean God Ekeko (photo), the average Bolivian cares about both and has no problem combining the two. Devotees buy miniature versions of their dreams. They get them blessed by a priest and offer them to Ekeko, the chubby God of Plenty, hoping their dreams will come true. In case devotees want wealth, they prefer buying perfectly copied miniature dollar-and-euro notes over the local currency (bolivianos). El Mercado de las Brujas, the Witches Market, is the place to go to buy these offerings. Stalls and shops are packed with miniature stuff such as cars, cameras, toys, but also degrees or little plastic babies. Note that according to tradition you shouldn’t buy your own Ekeko; he should be presented to you as a gift in order for the offerings to have effect. Easter, or Semana Santa (Holy Week) as Bolivians call it, is celebrated throughout the country with elaborate festivals and processions. One of the largest gatherings takes place in Copacabana, along Lake Titicaca. Here hundreds of pilgrims arrive on foot from La Paz on Good Friday. Copacabana is a place of pilgrimage throughout the year. And, truth be said, we particularly loved Copacabana for its ritual known as La Benedicion de Movilidades, or Blessing of Vehicles. Each Sunday morning, vehicles gather in front of the home of the Virgin de Candelaria Cathedral, decked out in a spectacular display of flowers and plastic knick-knacks. Priests bless the vehicle for a safe journey home while the vehicle owners pour champagne and light fireworks. Here’s the full story on the blessing of our Land Cruiser. It was still dark when we entered Valle de la Luna, right outside La Paz. The organizers had lit a bonfire and we could help ourselves to a cup of hot chocolate. At night the temperatures in the Andes Mountains can be freezing and I appreciated these gestures that made us feel welcome. We didn’t know whether we would be welcome at this still very traditional celebration which only became a national holiday in 2009: The Aymara New Year. The Aymara are one of the thirty-six ethnic groups in Bolivia (the current president Evo Morales is Aymara) and the main group inhabiting the altiplano – Bolivia’s high plains. June 21 is the winter solstice, which they welcome with ancient sunrise rituals and celebrations. While we all stood in a circle, the amautas – Aymara shamans – built a bonfire and made offerings, such as a dried llama fetus, for good health and fortune. The dried llama fetus is a much-used offering in Aymara rituals. Other offerings consisted of symbols made of sugar, such as tablets depicting a house, money bags, etc – like Alasitas, they have miniatures that represent their dreams. During the offerings, the amautas called onto Pachamama (mother earth) and Pachakama (the universe) to bless the New Year and give thanks to the sun. I assume the celebration takes place in many parts of Bolivia’s altiplano but I know for sure in Vale de la Luna (south of La Paz) and at Tiwanaku (2-hour drive from La Paz). The latter is a large-scale event while in Vale de la Luna it is a more intimate affair. El Gran Poder is one of the big ones that unfortunately we missed. I could return to Bolivia to visit it one day because I have heard many great stories about it. It is celebrated in late May or early June and is officially called La Festividad de Nuestro Señor Jesús del Gran Poder. What once started as a simple candle procession in one of La Paz’ neighborhoods, Gran Poder, has grown into La Paz’ largest religious festival with a daylong procession in which more than 25,000 locals participate in folkloric dances and music. Popular, among others, are dances such as the Suri Sikuris, Kullasada and Morenada. Make sure to be early to secure a place along the route, as pavements will be thronged with spectators. If you’d ask me which one was my favorite, I’d say this one. What a spectacle! It was huge, it was colorful, it was a happy event while emotional for the participants when finally entering that church and paying their respects to the Virgin. We stayed one long day watching the parade, which went on into the night, and which was followed by other rituals elsewhere the following day. The official date of the Urkupiña Festival is August 14-18, however, the last few years the event has started on August 13, with the Autochthonous Parade, so you may want to check the exact date when you’re in the area. Traditional dance and music groups from surrounding communities represent the Andean culture, wearing extraordinary costumes – especially masks – and playing ancient instruments such as panpipes. La Entrada, the main parade of this religious holiday, is on the 14th. From early morning until late at night dozens of dance and music groups parade the streets and dance up to the church where they pay their respects to the Virgin of Urkupiña – often by moving toward the altar on their knees to show their devotion. More about the Urkupiña Festival in this article. The best way, or the most obvious way I suppose, to find out if there are any celebrations in the city or surroundings is to check with the local Tourist Information. Some of these festivals have variable dates because they are established according to the moon calendar. Note that during these festivals it may be wise to make a hotel reservation ahead of time. This entry was posted in 5 Slow-Travel Destination Series, Bolivia Travel, Festivals & Events by Karin-Marijke Vis. Bookmark the permalink. I feel like all my questions were answered . análisis en el tema tratado. Hola, yo NO escribio que estos son LOS 5 mas populares. Yo escribio sobre 5 festivales populares, eso quere decire que hay otras tambien. Con certeza nosotros no hemos visto todo!